Half the fun of attending a pen show is meeting and hanging out with like-minded pen folks, but I thought I'd start my L.A. 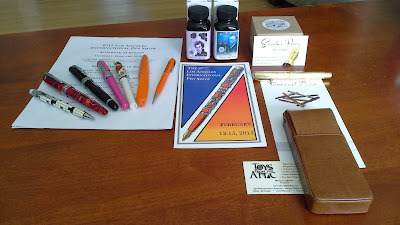 Pen Show report by posting some photos of the stuff I bought there ( ~ Click on photos to enlarge ~ ). Group photo below (from left to right): a nifty Retro 51 Crossword mechanical pencil from Anderson Pens, a Romet Asia fountain pen in the "Pomegranate" design, a Stipula Gaudi 'Casa Batllo' Limited Edition fountain pen from Penquest , a pink Pelikan 'Pelikano' fountain pen (purchased from fellow VPC member Dave Moffat), a Sheaffer 'NoNonsense' fountain pen and Pelikan "Twist" fountain pen from Sherrell Tyree of Ink-Pen.com, and a cool vintage mechanical pencil by Ritepoint with advertising for Orange Crush on it (also from Dave---thanks, Dave!). 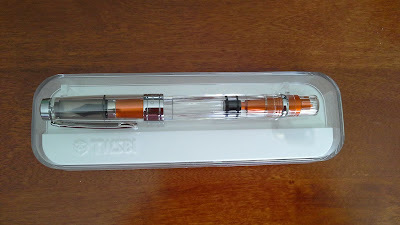 (photo below) A TWSBI 580 Aluminum fountain pen, purchased from the awesome Andersons (Brian & Lisa) of Anderson Pens. (photo below) A lovely all-metal Kosca button-filler, purchased from Peter Crook of Carneil Pens in Scotland. 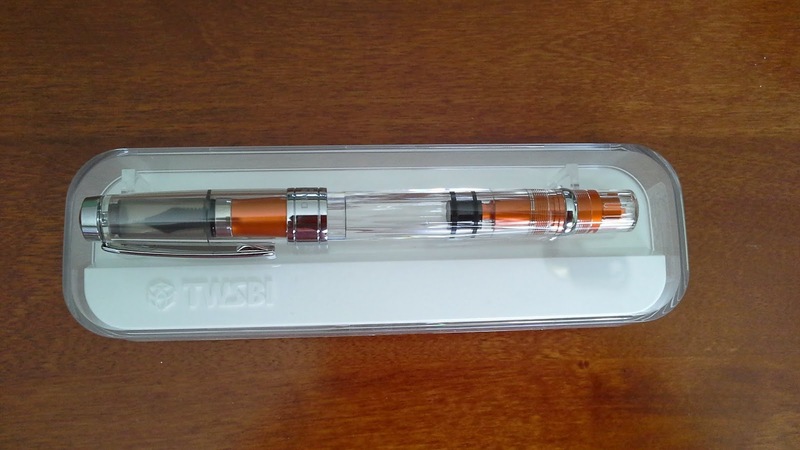 Probably my best deal from the whole pen show---only $60 for this lovely fountain pen! 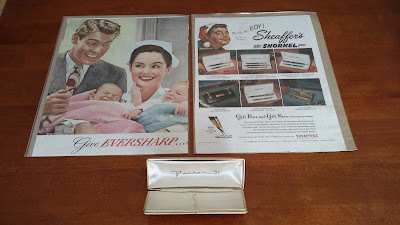 Sometimes you find a pen you've been seeking for a long time, and other times you find something you never knew you really wanted... until you saw it in person. 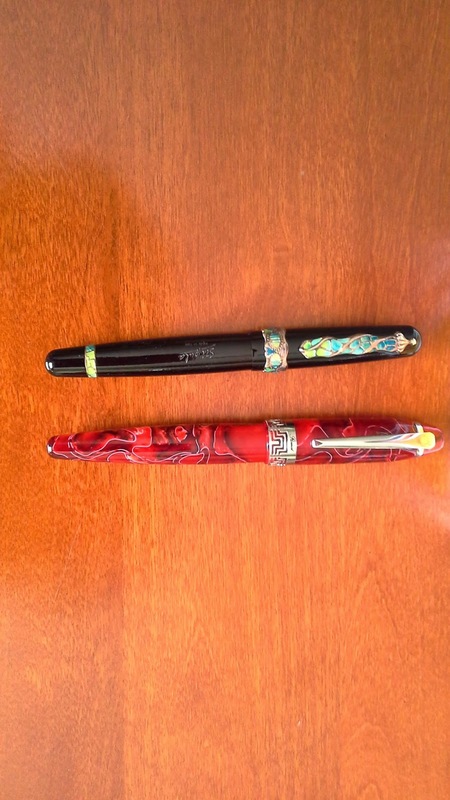 The former pen is the red Romet Asia in the red "Pomegranate" pattern (see photo below) . I'd been looking for this discontinued model for ages, with no success. I spotted it on the first day of the L.A. Pen Show but didn't buy it. Why? I have no idea, but I won't do that again! I found it again on day two and quickly purchased it. It's fitted with a 1.1mm Conklin stub nib but I don't mind---it's a gorgeous pen that has been on my Wish List since I saw it online a few years ago. 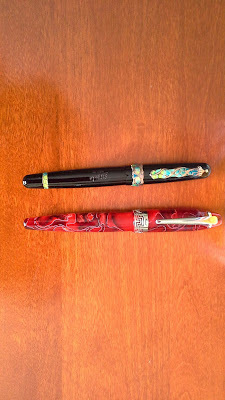 The Stipula Gaudi 'Casa Batllo' LE (in the same photo as the Romet pen below) was purchased from Kim Sosin of Penquest.com, a respected pen seller from whom I'd bought many pens in the past. I visited Barcelona with my husband in '98 and saw the building that inspired this pen, so I jumped at the chance to acquire it. It's a gorgeous writer with a responsive 14K Stipula white gold nib. My particular fountain pen is #147/193. 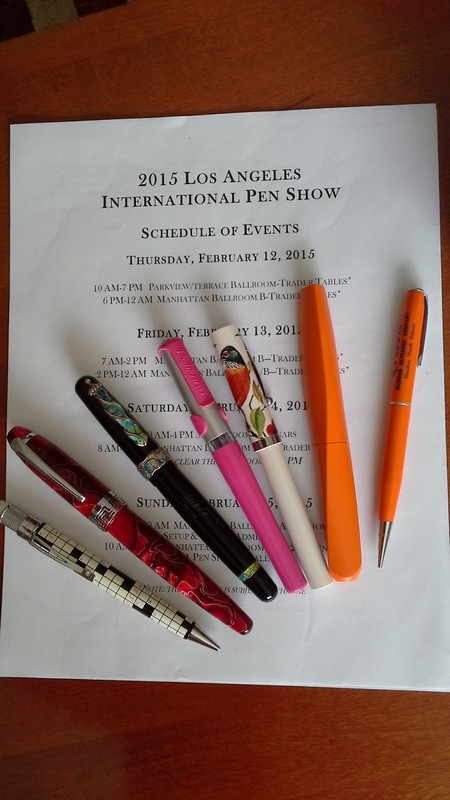 Hi Maja, great to see that you got to a pen show. Looks like a great haul of pens and 'stuff'. Love that Pelikan Twist, it's a cool shape. Thanks, Rick! The "Twist" is a cool design and the pen is comfortable to hold, despite looking a bit awkward when capped. 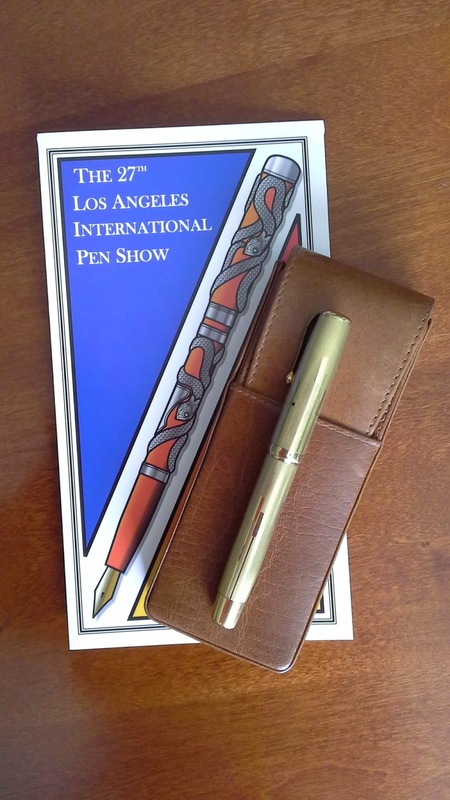 I had a great time in L.A - the weather is gorgeous, there was a lot to see (and not just at the pen show - I highly recommend the Getty Museum and LACMA) and the people in SoCal were so friendly. Luckily, I was able to visit my cousins in Sacramento on the same trip. All in all, a great vacation!